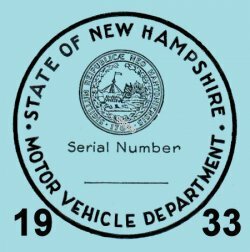 1933 New Hampshire inspection sticker - $20.00 : Bob Hoyts Classic Inspection Stickers, Add a Final Touch to your Restoration! New Hampshire began it's inspection program in 1931. This 1938 New Hampshire Inspection sticker was carefully restored both front and back keeping true in color and size to our original. For an additional $10.00 buyer can have your license plate number or VIN number placed on the front of this sticker.